Since it is Halloween, I decided to check the bookstore for an addition to my collection of ghost story books. One of the books I purchased was The Best of True Philippine Ghost Stories. The compilation was from the series with 25 books already released entitled True Philippine Ghost Stories which started on 2002. The series was published by PSICOM Publishing when they started compiling ghost stories from all over the internet communities and from personal interviews. 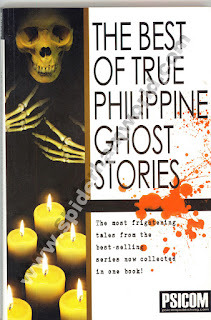 The Best of True Philippine Ghost Stories contains 88 stories from the 25 books that has been published by PSICOM. From white lady, possessed paintings, doppelgangers, haunted places to all the things that will make your spines tingle, it's all here in this book. dinadaan-daanan ko lang yang ghost stories na yan. Siguro dahil hindi masyadong ma-appeal sa akin ang ghost stories on book.